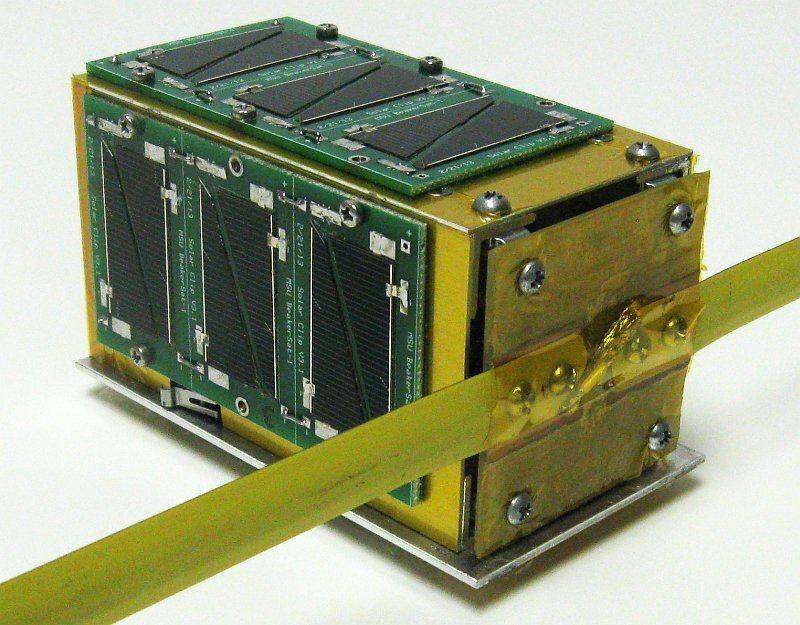 The $50sat team is celebrating 90 days in orbit by proposing a technical challenge to all interested amateurs. $50sat is capable of responding to uplink command packets: There are 3 open packets: Test packet - $50SAT responds by sending the RSSI of the received packet in slow FM Morse. Request data packet - the normal data packet is sent. Request RTTY - The RTTY is sent. In addition all received packets result in two copies of the ack packet being sent, that contains the RSSI of the received packet. All the required information to accomplish this is available on the drop box location available through the $50sat web page at www.50dollarsat.info . Anyone that can demonstrate a successful command uplink by submitting a recording of the response packet along with the date, time and location of of the contact will receive aCertificate of Technical Accomplishment signed by all three builders of $50sat. Submissions can be madeto the $50sat email address; 50dollarsat at yahoo.com. This is a significant challenge because there is no magic black box that you can buy to do this. 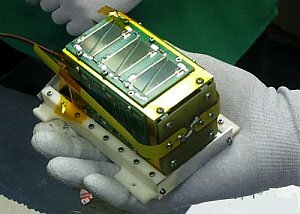 After 90 days of operation, the Kodak KLIC-7002 camera battery that powers the satellite has fallen off about 100mV, but operations still seem normal. We have also programmed a special 5th morse beacon to thank our launch sponsor and mentor prof. Bob Twiggs. Please give a listen for the message TNX KE6QMD on the FM Morse beacon. The primary purpose of $50SAT was to create a cost effective platform for engineering and science students to use for developing real world skills. The PocketQube form factor has no precision mechanical parts and can be built from locally obtained sheet metal. $50SAT is comprised of two 40mm square circuit boards. The first is the processor/radio board with the PICAXE 40X2 processor, the Hope RFM22B transceiver module and devices for measuring temperature some protection devices. The second board is the solar power control and monitor board. This board contains the maximum power point controllers as well as current monitors for the battery and summed solar power. The battery is a common 3.7V lithium ion camera battery. The $50SAT communications and measurements are sequenced in a program loop that constantly repeats. This loop starts as soon as the initial set-up of $50SAT has completed following a hardware or software instigated reset. Reset can occur for several reasons, a program crash following a RAM corruption for instance or measured over current or very low battery. To sequence the transmissions of the five different slow Morse beacons, fast Morse and the FSK RTTY, there is a sequence counter for the program loop (BeaconLoopSeq) that runs from 0-4 and back round to 0 again. Its the BeaconLoopSeq that controls which slow Morse beacon (0-4) is sent out on a particular program loop. The fast Morse and FSK RTTY are not sent at every program loop, but alternate according the values of BeaconLoopSeq. After the initial set up the $50SAT program executes its tasks in a specific order. Its difficult to give precise timings for where in the program loops these tasks occur as the Morse messages vary in length as does the word per minute (WPM) rate. The fast Morse data takes less time to transmit than the FSK RTTY and the sleep time varies too. Its best to use the slow Morse beacon as a marker. Of particular note is that the listen period for command uplink is the 10 seconds immediately after the end of the slow Morse beacon and the transmission of a single 'ready' packet. Measurements of voltages, currents, temperatures, SEU check. Transmit slow Morse beacon, one of 5 in rotation, starts approximately 12 seconds after the start of the program loop. Transmit a single 'ready' packet. Listen for incoming command packets for 10 seconds, listen period starts immediately after end of slow Morse beacon and the transmission of the 'ready' packet. Transmit fast Morse data on BeaconLoopSeq 1 and 3, starts approximately 11 seconds after end of slow Morse beacon. Transmit FSK RTTY on BeaconLoopSeq 0, 2 and 4, starts approximately 11 seconds after end of slow Morse beacon. Transmit data packet, transmitted immediately after end of Fast Morse or RTTY. Transmit FEC encoded data packet, transmitted approximately 6 seconds after the normal data packet. The tones used for the Slow Morse beacon will vary as the battery voltage changes. At 3300mV all transmissions are turned off, so there is little point in setting the Morse tone frequency for this low level. The limits used are 3400mV to 4300mV, although in normal operation the battery voltage should not exceed 3900mV. To make the voltage easy to read, at 3400mV the tone frequency is 500Hz, thus it will readily show up on the frequency display of FLDIGI, 500Hz = 3400mV, 700Hz = 3800mV, 1400Hz = 4300mV. etc. Note that at 3900mV, normal for a fully charged battery, the Morse tone frequency is 1000Hz, which is the same frequency used for the fast Morse. So for a fully charged battery, the slow Morse and fast Morse tones should be the same. Every other run of the main program loop (so approximately every two minutes at full battery) key data is sent out as fast 120WPM FM Morse. This is too fast to decode by ear, but there are several PC based programs that will decode fast Morse, you just need to install the software and feed the audio from a UHF receiver, a simple HT will do, into a PC. Then tune into the slow Morse beacon, remembering that the Doppler shift may be as much as plus 10kHz as the satellite is coming towards you and as much as minus 10kHz as its going away from you. This gives a possible tuning range of between 437.515MHz and 437.495Mhz. The [AR]2[AR]2[AR]2[AR] sequence are sync characters. The data sent in fast Morse is; battery volts, solar volts and solar current. QSL cards are still available to anyone that posts telemetry, either hand copied CW or RTTY captures, to the 50dollarsat yahoo group.